History of Schuitemaker | Schuitemaker Machines B.V. When Johan Schuitemaker Senior’s military service ended at the end of the Great War, he and his brother started a forge across from his parental home in the hamlet of Notter, under an old hay barrack. After a few years, they moved to Veer on the river Regge, near the village of Rijssen-Wierden where they bought a piece of land end of May 1919. That is where they built a workshop, which would later become a forge, a wheelwright, a sawmill and a retail outlet for farm equipment. They started producing steel and wooden wagons, as well as hexagonal roofs for haystacks. They also imported machines from Germany, and they would soon be trading all kinds of goods for agriculture use. During World War II, the Schuitemaker's main income was from repair work. And there was no shortage of work in those days. Modern farm mechanisation was on the rise after the war, and Schuitemaker secured dealerships for tractors and milking equipment. Horseshoeing was a dying trade since the old farm wagons got out of fashion and were replaced with wagons on pneumatic tyres. The success of Schuitemaker Machines BV started in the fifties, when an American 4-wheel manure spreader was popular among Dutch farmers. Schuitemaker were frequently called in for repairs. It was a rather complicated machine and repairs were time-consuming. This was one of the reasons why Schuitemaker saw the need and the chance for producing a better and less complicated manure spreader with many optional extras. Johan Schuitemaker junior borrowed a drawing board from the local technical school to design a new wagon, which he patented in five countries. This type of manure spreader, the popular SMS 3000, fitted with the well-known closed oil bath sump, was the showcase of Schuitemaker Machines for many years and the beginning of the company success story. 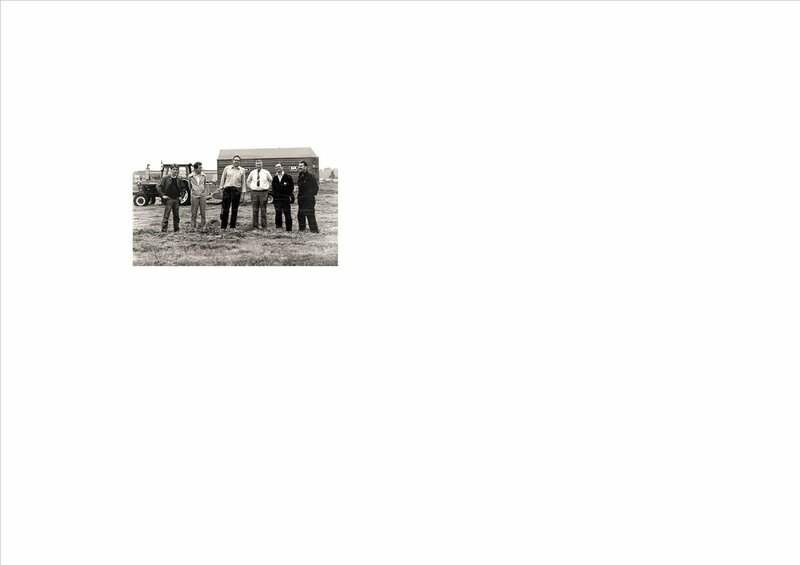 In 1963, Schuitemaker moved with all their 35 staff to the industrial site “de Mors”. They were one of the first businesses that moved to this site. 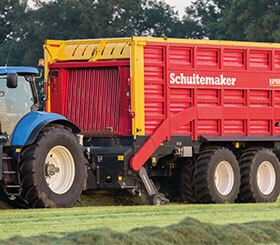 Building on the great success of their manure spreader, Schuitemaker went on with new developments and designs. Thanks to their good relations with Wageningen University and the foresight of Johan Schuitemaker Jr., the popular UTW (Universal Transport Wagon) went into production. This farm trailer with a 180° rotary platform was used as a land cultivation wagon, as a feeder wagon and as a silage wagon at the time. This system only allowed for steel front and side panels. Continuous problems occurred when suppliers failed to meet Schuitemaker’s high quality standards. Because of the continuous problems with suppliers of steel front and side panels, Johan Schuitemaker went to Italy to purchase a cold profile roller in 1966. Shortly after his return, this machine roller was installed in the Rijssen factory. Since the capacity of this cold profile roller exceeded the need for Schuitemaker's own production by far at this point in time, the company went frantically looking for work from third parties, and not without success. That is the reason why Schuitemaker has been making steel side panels for other agricultural machine manufacturers, and several truck and truck body manufacturers also outsourced their production to Rijssen. All current DAF army trucks on the road today are fitted with side panels made by Schuitemaker. At the end of the 1970's was a growing demand for mechanised feeding. The Feedo feeder wagon was developed on the basis of the existing UTW concept. In the meantime, the Feedo is used for various applications and sold all over the world. The Feedo also forms the basis for the Cowa compost distributor. Even today, the Feedo is an important product in the Schuitemaker programme. Schuitemaker introduced the Rapide precision chop loader wagon, the world's very first dual-purpose loader wagon. The Rapide has now become Schuitemaker's best-selling product. Inspired by changing legislation for processing manure, there was a growing demand for larger manure tanks and injectors in the 1990's. Schuitemaker would soon take advantage of this trend and came up with injectors and a comprehensive range of slurry tankers. In 1996, Schuitemaker won the RAI Agriculture Award with their Robusta variable track width pump tank wagon. The end of an era with the last SMS 3000; over the years, more than 25,000 of these manure spreaders have been manufactured. The start of the new millennium saw a great expansion of the business. Thanks to continuous growth, the company had outgrown their existing premises. As well as a new production hall of 1500m² and a covered storage area of 1000m², a second storey was built on top of the existing office building. This resulted in a site measuring 46,000 m², including 12,500 m² of floor space. The ever-increasing size of machines required more production space. The semi-finished products that came with these machines also required more storage space. That is the reason why the decision was made for the construction of two new, spacious assembly halls with a combined floor area of more than 4,400m². One of those halls was designed for the production and assembly of specials. To future-proof their enterprise, Schuitemaker went out to look for a second line of business with an affinity in the agricultural sector. As a result, Schuitemaker became the sole importer for Epoke winter machines in September 2007. The new Rapide dual-purpose loader wagon was introduced in 2007. At this particular time, the Rapide was 25 years old! The new model delivers a more compact, more efficient and technically enhanced version of the Rapide. The intake is improved, RapidFlow, RapidStream, resulting in less wear, fuel saving and improved feed structure. A new colour scheme was introduced. The white rims and charcoal-grey undercarriage make the redesigned wagons identifiable at first glance. The Rapide is ready for the future! The oldest halls of the factory on Morsweg in Rijssen were completely replaced. In addition, the cafeteria was refurbished and more office space was created. The alteration was necessary, but it also optimised the production lines. The practice test version of the Innovado was presented at the EuroTier 2014. This automatic feeding system had been further developed since the introduction of the prototype in 2008. The unique concept of the Innovado is the fully automated process of getting, cutting, rationing and supplying the feed, as well as topping up and returning. In addition to the existing semi-automatic variants, the Innovado is the only fully automated feeding system. One of a kind. A welding robot was purchased to optimise the production process. This biggest welding robot in the Netherlands was put into operation in January 2016. Schuitemaker started his hundredth year of life. Since 1919.